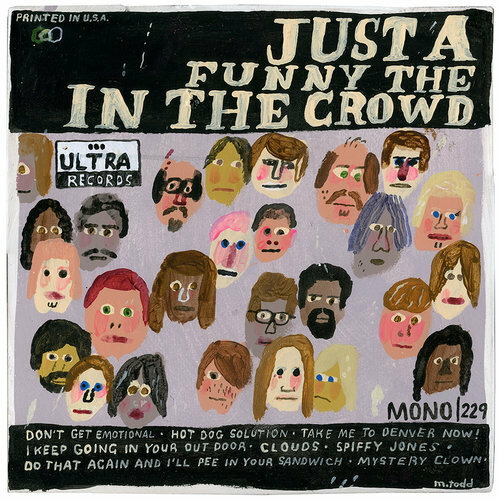 Mark Todd, Just a Funny the in the Crowd, 2017, acrylic on wood, 12 1/2 x 12 1/2". The acrylic-on-wood LP covers are rendered in a scrappy, cartoonish style somewhere between King of the Hill and Raymond Pettibon, and, for all of their tongue-in-cheek vagaries, their compositions and palettes are skillfully nuanced. Tracks listed in the illustrations include “I Keep Going in Your Out Door” from the album Just a Funny the in the Crowd; “Everybody’s Something Sometime (But Not This Time)” on the album Tender Trap; and “You Are The Reason I Can’t Get a Job” by the Back Up’s (all works 2017). Todd’s cannily chosen textual motifs act as phantom signifiers for songs never written and never heard that nonetheless act as nostalgic sound tracks for personal histories. Today the physical album is all but a corpse, picked apart by the digital epoch, with many songs discarded into the boneyard of iTunes. In this age’s art world—full of step-and-repeat backdrops and Instagram posts—Todd balances jocularity with affection for a less self-conscious bygone era, while his off-kilter versions of the endangered originals provide a consuming viewing experience reminiscent of the enjoyable hours many once spent flipping through vinyl in record stores.